As I wrote in the previous post, there are now rods in the game. They are one charge items that recharges upon rest and may have area effects. There are also some new and interesting items that you have to figure out how to interact with. There is also new level content such as caves. The interface and feedback has been improved on many parts. 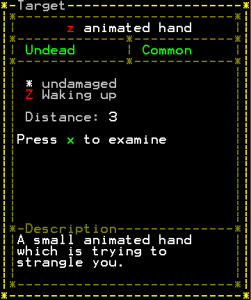 As I wrote about in this post, the target system is now much better: you actually control the cursor with the arrow keys instead of just toggling monsters through a list. The service upgrade/preview system has also been reworked and is much smoother in previewing upgrades. I’ve got many requests for making it possible to autorun in other places than corridors. I have implemented this in TGGW-style, so you still use the space key to autorun. It works just as in corridors and it will make you run in the same direction as you previously walked. Autorun also works even when sleeping monsters are around and will now correctly stop before you can get hurt or wake up any monsters. 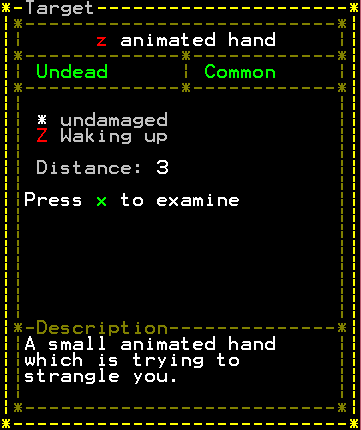 A red ‘Z’ indicates that the monster will wake up if you step closer. A lot of player feedback is now clearer. For instance, the sleep symbol on monsters will change when they are about to wake up, and you will see the distance to any monster in number of squares when you target it (this is useful both for stealth and ranged combat purposes). You can now see the distance in squares from a targeted monster. Some difficult but minor bugs. Reducing number of hopeless situations. Being able to target and review features. ◀ New Item Category: Rods! Awesome! Can’t wait to try it out. What are those caves? Is it a room which can be discovered past mysterious vein? Also, I have found that after I upgrade velvet robe to thief robe, it can’t be upgraded further, tailor just offers to make thief robe from thief robe for 0 gp continuously. Caves are part of some levels that have a cave-like structure rather than rooms, more open areas. The bug with such upgrades (there were a few of them) have all been fixed in the coming version. Waaaaahoooooooo I can’t wait ! When ZeBlob told me about you game and that it was in our Roguelike Bundle for some time already I was shocked to discover a game that deep ! We are very impatient to do a review/let’s play \^o^/ and I’m very happy that you displayed his photo montage in your FAQ I think it’s great ! Do you have a twitter account or a TGGW twitter account to follow ? I would really appreciate a review or let’s play! Right now the best way to follow the development is through this blog (you can subscribe by RSS).